You live a healthy lifestyle. You eat the right foods (most of the time) and try to stay fit and active, but have you ever thought about what all those stiletto heels and flat-footed flip flops are doing to your foot health? 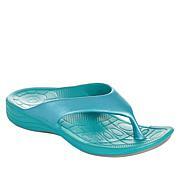 With Aetrex's built-in Lynco orthotic footbed, beauty doesn't have to equal pain. These soft leather sandals also include two, fully adjustable straps and anti-microbial technology for a truly enjoyable walking experience. Shoe fits true to size. 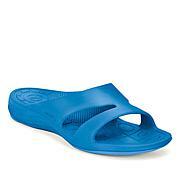 Feels great on out of box ... arch support, adjustable straps, cushion soft footbed. Wore to two different weddings on back to back weekends and feet felt great! No pain at end of night with wear time over 8 hours plus dancing. One of most comfortable shoes I own.